Sometimes a pus-filled abscess (infection that is walled off from the rest of the body) forms outside the inflamed appendix. Scar tissue then "walls off" the appendix from the rest of the abdomen, preventing infection from spreading. 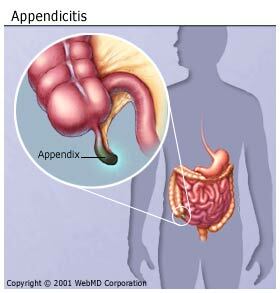 An abscessed appendix is a less urgent situation, but unfortunately, it can't be identified without surgery. For this reason, all cases of appendicitis are treated as emergencies requiring surgery. In the U.S., 1 in 15 people will get appendicitis. Although it can strike at any age, appendicitis is rare under age 2 and most common between ages 15 and 30. You have pain that matches these symptoms. Do not eat, drink, or use any pain remedies, antacids, laxatives, or heating pads, which can cause an inflamed appendix to rupture. If you have any of the mentioned symptoms seek medical attention immediately since timely diagnosis and treatment is very important. If you have any of the mentioned symptoms, seek medical attention immediately since timely diagnosis and treatment is very important. Diagnosing appendicitis can be tricky. Appendicitis symptoms are frequently vague or extremely similar to other ailments, including gallbladder problems, bladder or urinary tract infection, Crohn's disease, gastritis, intestinal infection, and ovary problems. If appendicitis is even suspected, doctors tend to err on the side of safety and quickly remove the appendix to avoid its rupture. If the appendix has formed an abscess, you may have two procedures: one to drain the abscess of pus and fluid, and a later one to remove the appendix. Within 12 hours of surgery you may get up and move around. You can usually return to normal activities in 2 to 3 weeks. If surgery is done with a laparoscope (a thin telescope-like instrument for viewing inside the abdomen), the incision is smaller and recovery is faster. Increased pain in your abdomen. Blood in your vomit or urine. Increased pain and redness in your incision. There is no way to prevent appendicitis. However, appendicitis is less common in people who eat foods high in fiber, such as fresh fruits and vegetables. Reviewed by The Cleveland Clinic Department of Gastroenterology. Edited by Louise Chang, MD, WebMD, November 2005.